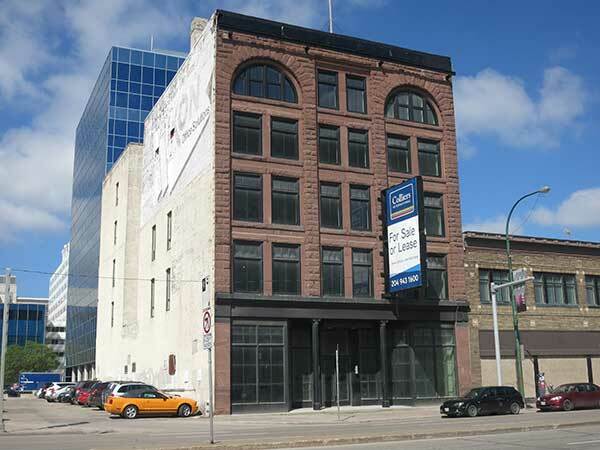 This brick structure, originally consisting of six floors, was built in 1904 on designs by Winnipeg architect James H. Cadham as the headquarters for the Scott Furniture Company. Found in 1874 by Thomas Scott, the retail furniture store and warehouse was operated by Frederick W. Scott, his son, into the 1930s. On 13 June 1905, lightning struck the building and caused a major fire that destroyed the rear and side walls and all of its contents. Repairs were done later that year. Similar damage resulted from a fire on 23 March 1914. Reconstruction in 1915 under the supervision of Ralph B. Pratt and Donald A. Ross added an internal concrete frame to which the walls were attached and removed the uppermost storey. Sometime during the 1960s or 1970s, metal cladding was installed on the front of the building facing Main Street. The cladding was removed during a renovation done in 2013 and 2014, revealing the red stone from the 1915 restoration. A municipally-designated historic site, in 2014 it received a Conservation Award from Heritage Winnipeg. Scott Block, 272 Main Street, City of Winnipeg Historical Buildings Committee, April 2011.